Protection & Separation A powerful combination of a wedge and a protective stainless steel plate that is thin enough to accommodate most narrow spaces easily. 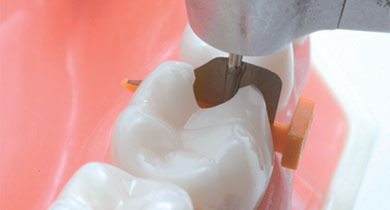 When inserted, FenderWedge pre-separates the teeth by a few tenths of a millimeter which aids in the final building of the contact point. 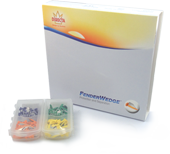 FenderWedge also protects adjacent teeth during Class II preparation, stays in place, facilitates easy placement of matrix and can be inserted as easy as a wedge. 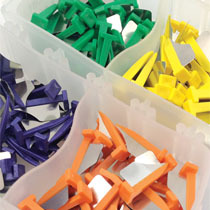 One hand operated organizer box. It contains 144 FenderWedges total. 1.0mm wide purple wedge with .08mm thick metal shield. Available in regular 36pc refill or 100pc Value pack. 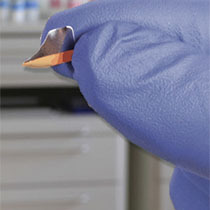 1.4mm wide orange wedge with .08mm thick metal shield. 1.9mm wide green wedge with .08mm thick metal shield. 2.3mm wide yellow wedge with .08mm thick metal shield.